Organza necklace 3 laps chip, especially for hanging type donut. These necklaces are made with 3 delicate organza ribbons decorated with semiprecious stones chip that can be agate or green jade. It is possible to hang a donut pendant in the central part of the ribbons by means of a simple loop. 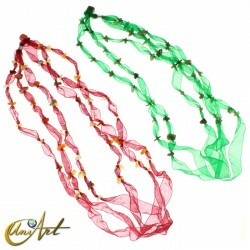 The open organza necklace measures about 65 cm in length. Jasper beads necklace. An appreciable handmade jasper necklace made up of oval beads and spherical intervals. The jasper in which this necklace is formed boasts soft autumnal colors, from beige to brown through various shades of terracotta. It is a relatively long necklace, about 75 cm that has no closure. 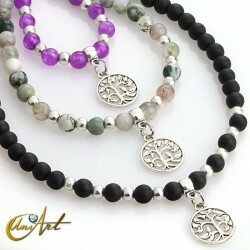 Necklace of varied natural stones. 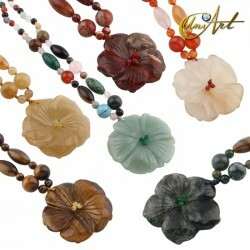 This natural stones necklace is composed of beads of various sizes and formats of agate, carnelian, tiger eye and rose quartz. This delicate mix of colors and sizes gives this handmade necklace originality and elegance. 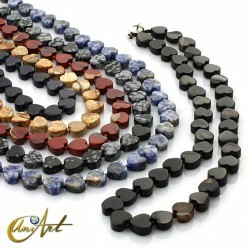 The average size of each necklace of natural stones is about 50 cm. 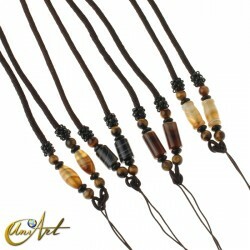 Necklace of varied beads of agate. With a very elegant combination of green agate, black agate and carnelian (red agate) this agate necklace is made with beads of different shapes and sizes. 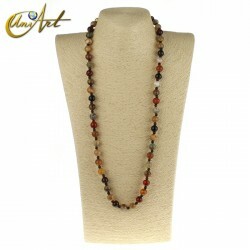 The agate beads of this beautiful necklace have natural streaks and the characteristic brightness of agate. 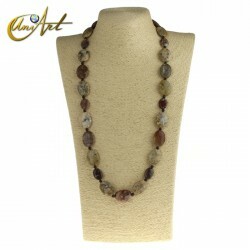 This necklace of natural stones measures about 50 cm. In this section you can buy a large selection of bijouterie necklaces in semi precious stones. 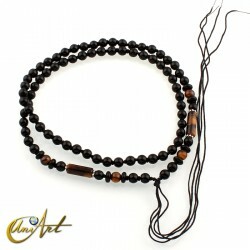 These handmade necklaces are made with natural stone beads with an excellent price and quality. We have a wide variety of bijouterie necklaces, as long necklaces, short necklaces and man necklaces, which are ideal as complements and fashion accessories with which combine your looks. In addition, the handmade jewelry made with semi precious stones presents a number of properties that are very good for people.